It's really as simple as repeatedly soaking anywhere from 1 to 3 cotton balls with your favorite fragrance which are then left out in the open on a plate for the alcohol to dissipate. The scented cotton balls should be pretty strong in order to infuse your powder. Heavier scents such as my Chanel no 5 Premiere and Ambre Gris by Balmain worked really well. Place cotton ball(s) into 1 to 3 cups of powder and push down until it's in the center. Tightly close the lid and let stand a week. At the end of the week stir the powder and recap for another week, If it does not seem strong enough at first, soak more cotton balls and repeat the above. Another way to gently scent your powder is with fresh rose petals (organically grown) that are layered between the powder like a cake. The same curing process as above applies. After the curing time of a few weeks is up, remove cotton balls and sift powder into it's new home. In my case here, a glass candy dish. And that's it! If you have a broken white or peach shimmery eye shadow, sprinkle a bit into your DIY body powder for an illuminating effect. Blush and bronzer can work the same. 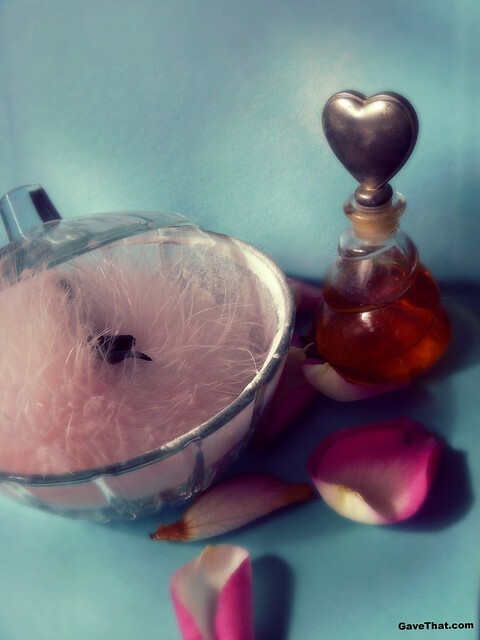 Want to make a truly personal perfume for your powder? 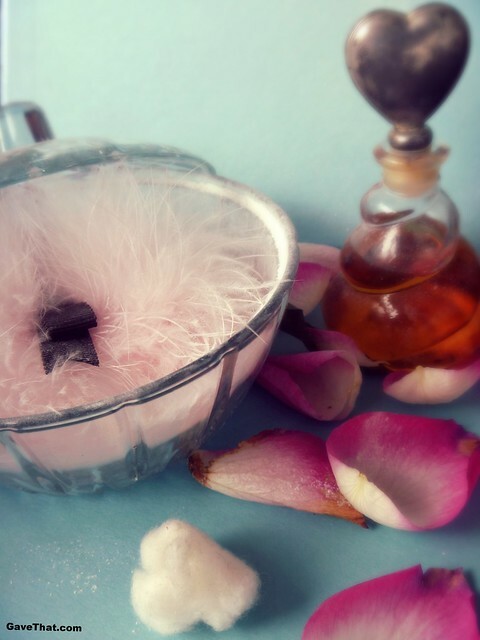 See these previous how-to here on composing your own signature scents.